In the EU, women are paid 16% less than men on average. This means that, when compared to their male colleagues’ salaries, women work two months out of twelve for free. PES Women launches its 2018 Gender Pay Gap campaign today (28 February), on European Equal Pay Day. Equal Pay Day is the day each year in spring until which women would have to work to earn the same as their male colleagues in the previous year. This year’s focus is on the pension gap. The gap between the amounts women and men receive when they retire is 39%. The campaign launch event in Brussels today brings together representatives from women’s rights organisations, trade union representatives, members of national parliaments and MEPs. At the event, guests will see the premiere of the campaign’s headline movie. Created by the agency mortierbrigade in partnership with the progressive women’s organisation zij-kant, the TVC highlights the problem of the pension pay gap in a funny and thought-provoking way. Discussion after the screening will focus on concrete proposals for closing the pension gap and gender pay gap, such as the Icelandic model. “Although the European Commission presented a roadmap on closing the gender pay gap last year, we still need concrete action from the EU and its member states to combat unequal pay. Women still receive much less than men, especially after retirement. “With regard to salaries, the gender pay gap is 16%, but for pensions it is higher than 39%. This leads not only to more inequality, but also to more poverty among women. In 2018 this is unacceptable. PES Women promotes best practice by countries like Belgium and Iceland in reducing the pay gap, and facilitates the exchange of views and information on the issue among its member parties, ministerial meetings and networks. The 2018 equal pay campaign is the latest effort in the fight for equal pay and social protections for women of all ages. PES Women, zij-kant and mortierbrigade have worked together on pay gap campaigns for three years in a row. Previous campaigns (‘Start sooner for an equal pay later’ in 2017; ‘Pay me like a man’ in 2016) caught the eye of the public as well as stakeholders. The creative directors of the campaign this year are Jens Mortier, Joost Berends and Philippe De Ceuster from mortierbrigade. The movie is directed by Joe Vanhoutteghem, the director of photography is Grimm Vandekerckhove and the production company is the acclaimed Czar of Belgium. Download the poster of the new Equal Pay Day campaign. 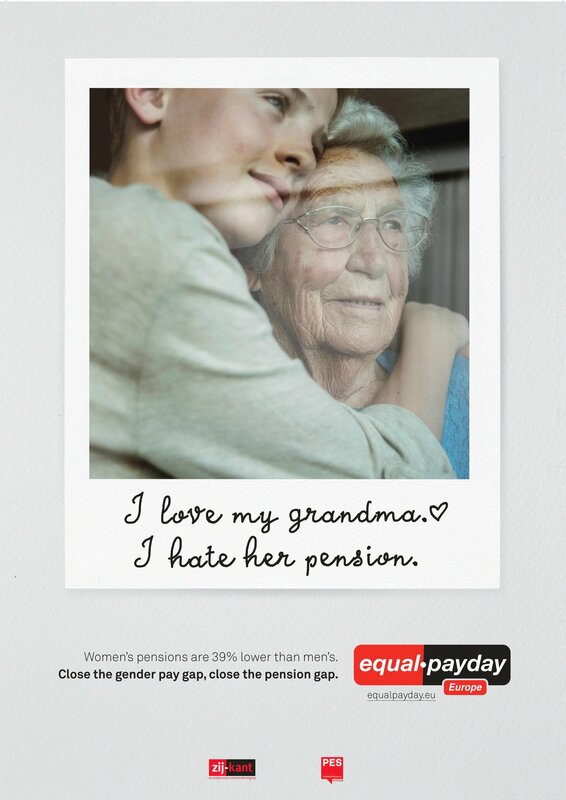 Download the postcard of the new Equal Pay Day campaign. Postcards in other languages can be found here. Social media headers and images of the new campaign can be found here. The average gender pay gap in Europe is 16.3%. This is the difference in average gross hourly wage between men and women across the economy. The average gender gap in pensions in Europe is 38.6%. This measures the differences in pensions between women and men, excluding non-pensioners (pensioners aged 65-79). Below you find the gender pay gap (Eurostat, 2016) and the gender gap in pensions (Eurostat, 2015) in percentages per state. Discover here how PES Women members tackle the gender pay gap in their country.